Wonderful beaches, gorgeous lagoons and lush greenery are just some of the settings you’d expect in the South Pacific – and Vanuatu certainly doesn’t disappoint. It’s a laid-back locale where time seems to stretch on forever, through sunlit days and starry nights, giving you a sense of serenity, which is perfect for a Vanuatu wedding. Port Vila, Vanuatu’s capital, offers an array of resorts with all the facilities and services you’ll need for a memorable destination wedding. If you’re looking for something a little more remote, there are other islands in the archipelago offering sublime beaches in beautiful locations, as well as stylish resorts. 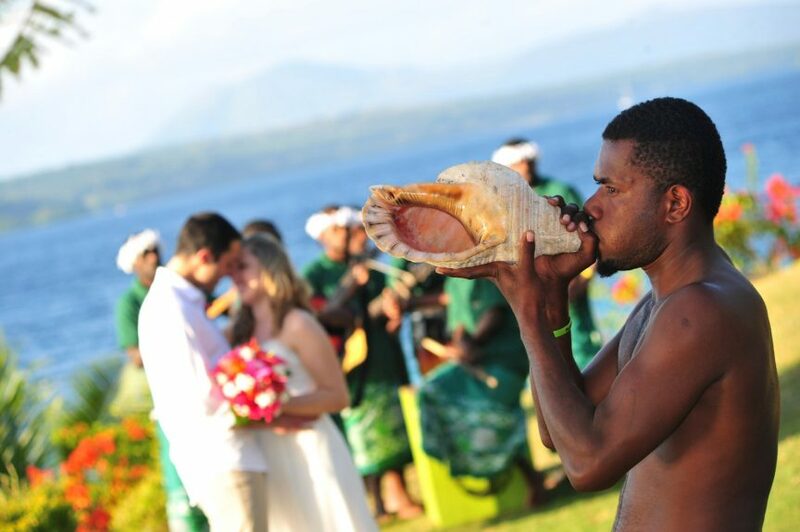 To get married in Vanuatu you’ll need to contact a local wedding organiser who can provide you with an application form and answer all of your queries. Your marriage application must be lodged with the Vanuatu government at least 28 days prior to your wedding. You and your fiancé need to be in the country together at least three days prior to the wedding. Take your passports with you and have one witness for each of you, to prove your identity. According to Vanuatu Tourism, it’s best to visit during April to October, when temperatures range from 18 to 28 degrees Celsius. November and December are warm but not usually unpleasant. January to March is hot (26 to 34 degrees Celsius), often wet and prone to cyclones, but as it’s also the low season you can take advantage of cheaper travel deals. While many store workers have a siesta from 11.30am to 1.30pm, supermarkets, banks and the post office remain open. Most shops are closed on Sundays, except when cruise ships arrive. The Vatu (VT) is the official currency of Vanuatu. While the Australian dollar is accepted in many places in PortVila and in Luganville on Espiritu Santo, it isn’t accepted elsewhere. There are about 250 ATMs in Port Vila and Luganville, and you can also change money at the airport. Major credit cards are accepted at most of the larger resorts and hotels. To find your dream Vanuatu wedding venue, visit our exclusive directory of stunning resorts and hotels that specialise in destination weddings. Header image: The Havannah Resort.